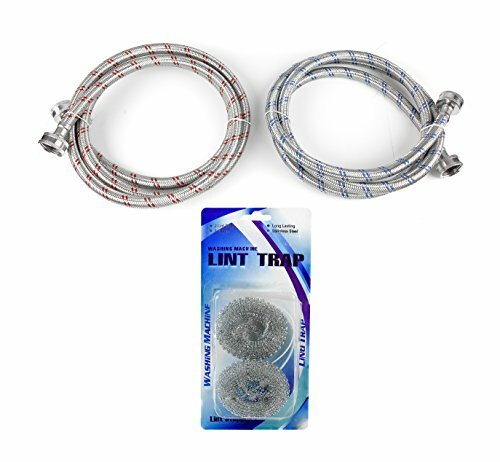 This premium set of Stainless Steel Washing Machine Hoses are designed to handle the stresses of the laundry room - extreme hot and cold temperatures, countless hours of use in cramped spaces and the agitation and friction from a running washing machine. These stainless steel washing machine hoses are 6 Feet of supply hose means you can move the washer around for retrieving lost clothes or normal maintenance - without having to disconnect the washing machine inlet hose every time. You wont have to strain your self reaching into awkward positions to connect and disconnect a washer hose that is too short. Pick up our Equpure Brand washing machine connectors and compare them to any other off the shelf washer hoses. You will feel the high quality materials, workmanship and heavy duty. Don't risk using inferior rubber or other low quality hoses leaking water and damaging your home and property! ✔ FREE Ultimate Ebook guide for both Products. 6 FT LONG - Two premium stainless steel washing machine hoses. Blue for Cold Water and Red for Hot Water. BURST PROOF - Braided stainless steel ensures maximum pressure. Guarantee's no flood or leaks. FITS ALL WASHERS - Universal washer hoses easily connects to Bosch, Frigidaire, GE, Kenmore, LG, Samsung, Whirlpool, Speed Queen, Siemens, AEG, Maytag, Amana, Philips, Panasonic, Hoover, and MORE! WIDE OPENING - Allows washers to fill 50% faster than other leading brands, spend less time waiting for laundry. FREE WASHING MACHINE LINT TRAP & FREE EBOOK - You will receive a free 2 pack that stops lint from clogging laundry tub or sink and You will receive a free ebook about both products and how to use them. If you have any questions about this product by EQUPURE, contact us by completing and submitting the form below. If you are looking for a specif part number, please include it with your message.